Out of all the products currently being peddled by iLuv, this iPod battery recharger has the best build quality we've seen. Whether or not there's demand for it is hard to say given the proliferation of car, desktop and other chargers out there. 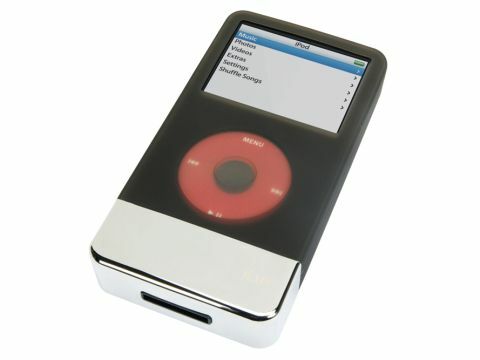 The unit has a silver compartment that holds a rechargeable lithium battery capable of delivering 42 hours of power to a 30GB video iPod. If you have a 60GB or 80GB iPod you'll need the i604; both are available with white or black skins. Fixed to the silver base is the silicon skin and a dock connector jack. The charging starts when you slip the iPod into the skin and wedge it on the dock connector. To recharge the iLuv battery you need to use your standard dock connector cable that came with your iPod to use with your Mac or the socket adaptor in the iLuv box. It's quite heavy to carry around, especially when coupled with the adaptor, which could stop some from buying it.